Get some seafood into the cookout mix with Spicy BBQ Shrimp Kabobs. BBQ sauce and arbol chiles give Spicy BBQ Shrimp Kabobs their special kick! Blend barbecue sauce and chiles in blender until smooth. Cut each ham slice into 4 lengthwise strips. 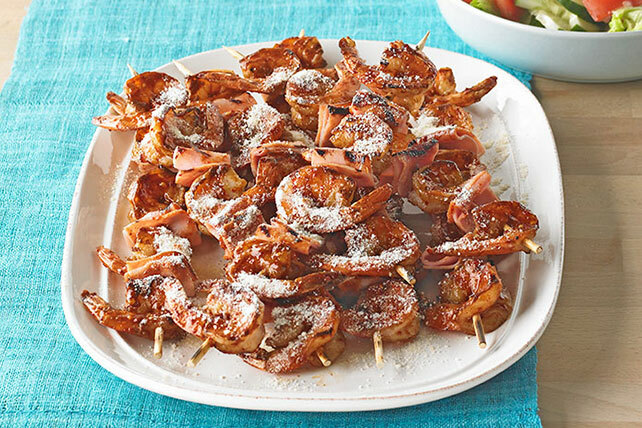 Thread shrimp alternately with ham onto 8 skewers. Grill 5 to 7 min. or until shrimp turn pink, turning and brushing occasionally with barbecue sauce mixture. If using wooden skewers, wrap ends in foil before adding to grill to prevent them from burning. Also, skewers can be soaked for about 1 hour in water before using to prevent them from burning on the grill. Arbol chiles have a heat level of 7.5 on a scale of 1 to 10. With a Scoville heat unit between 15,000 to 30,000, they have about as much heat as ground red pepper (cayenne). Use fewer peppers if you want less heat. Substitute 2 Tbsp. crushed red pepper for the arbol chiles.